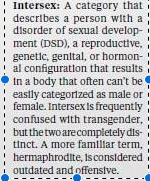 I recently learned that National Geographic Magazine (@natgeo) plans to use hurtful, pathologizing language to describe intersex people in their upcoming January issue, “Gender Revolution” (as seen in pics below). I am so disappointed as I’d been contacted to be a part of the accompanying documentary (airing in January), and although my schedule did not permit, I was excited about it as it sounded fantastic. 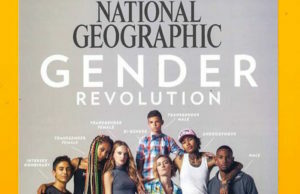 Communications should be addressed to: @susanbgoldberg; Susan B. Goldberg, Editor in Chief of National Geographic Magazine, Editorial Director of National Geographic Partners. Email: @sgoldberg@nationalgeographc.com, askngs@nationalgeographic.com, ngsforum@nationalgeographic.com. Fax: 202-828-5460. Address: Editorial Services, Natl Geo., 1145 17th St. NW 20036.